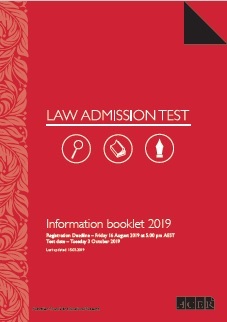 The Law Admission Test (LAT) is a professionally designed and marked selection test developed to assess the types of aptitudes and skills that are critical to success in the Law program at UNSW Sydney (The University of New South Wales). These aptitudes and skills include thinking critically, analysing material, and organising and expressing ideas in a clear and fluent way. The LAT has been developed by the Australian Council for Educational Research (ACER) in conjunction with UNSW Law and is used for selection into undergraduate level programs in Law. Registrations for the LAT 2019 will open on Monday 6 May 2019. The LAT 2019 will be held on Thursday 3 Oct 2019.